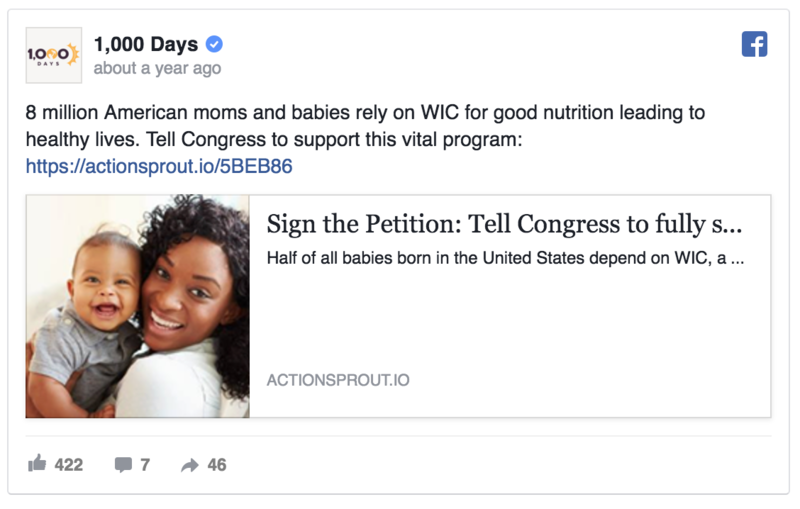 How one nonprofit collected hundreds of thousands of signatures and greatly grew their Facebook page through consistent daily posting, social actions and lots of hard work. 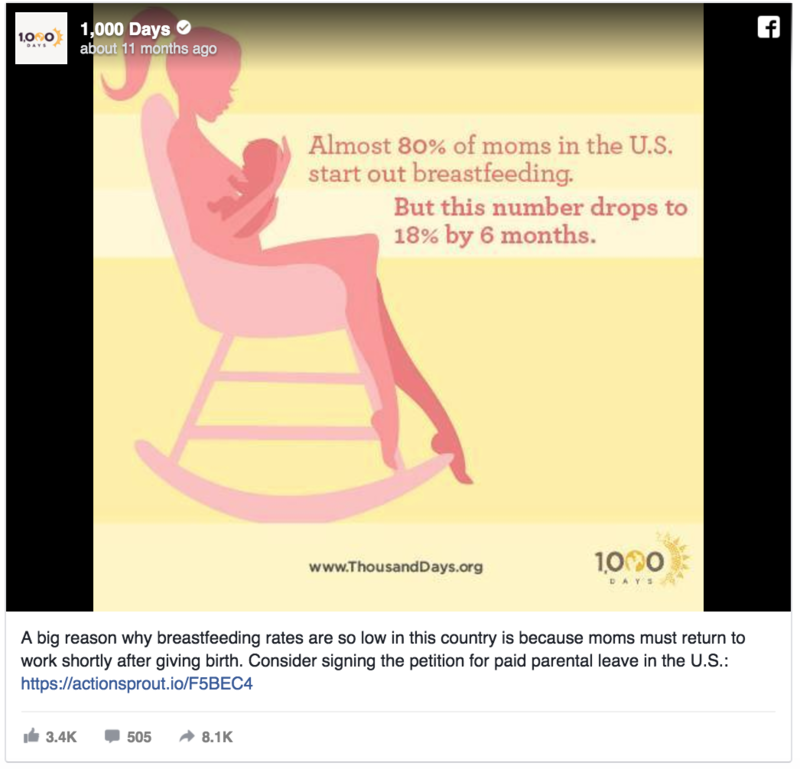 Meet 1,000 Days, the leading nonprofit organization working in the U.S. and around the world to improve nutrition and ensure women and children have the healthiest first 1,000 days after childbirth. 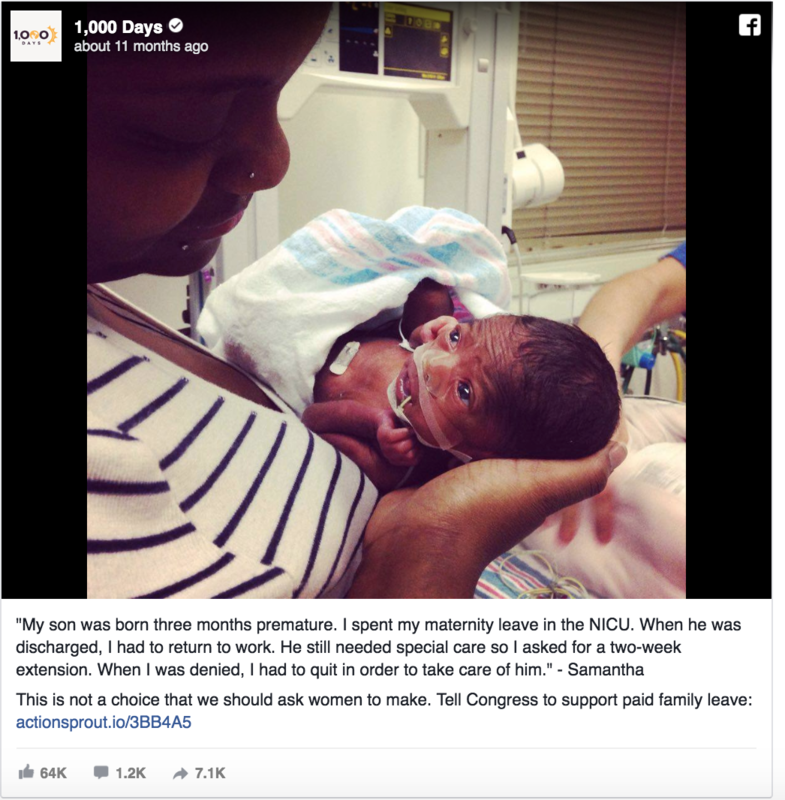 The 1,000 Days team wanted to create strong support around a new national paid family leave policy and the U.S. Government’s Women, Infants, and Children (WIC) nutrition program. To accomplish this, they created social actions through ActionSprout that informed and mobilized their Facebook supporters to take action. In the process, they were able to influence public policy and grow a group of supporters passionate about the issues. How did they gain such staggering success? By consistently making 2 to 3 posts a day their team ensured supporters were always engaged and that 1,000 was at the front of their minds. 1,000 Days maintained careful audience targeting to reach the "right" people, who were most likely to engage and further the campaign. Sharp, clear, petitions that communicated what was at stake, what needed to change, and how. Sharing personal accounts, shocking figures, and real family stories of hardship and impact to emotionally connect with current and potential supporters. Let's take a look at a few of their campaign Facebook posts. Is your campaign sharable? Will supporters want to be seen sharing it with friends and family? Is your campaign targeted? What are you asking supporters to do? Is it clear and tangible? Does your campaign have an emotional aspect? People are more likely to take action when you speak to their emotions, rather than their logic. Is it personal? How will this effect your supporters' lives or the lives of those they know? Is there urgency? If your supporters feel like they can come back and deal with this later you have lost them. Is your campaign possible? Is what you're asking for reasonable? Login or sign up here.